"KONIG -- Philip Jacob, s. of Nicolaus Konig, and Maria Barbara, d. of Jacob Wilhelm; Apr. 1, 1763; in Jacob Wilhelm's house." 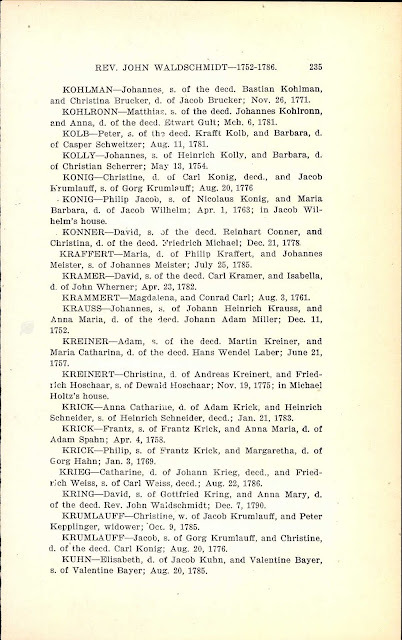 "Pennsylvania Marriage Records, 1700-1821," indexed database with digital images, Ancestry.com (https://www.ancestry.com : accessed 23 January 2019), Lancaster > Rev. John Waldschmidt, 1752-1786, page 235 (image 33 of 61), Philip Jacob Konig and Maria Barbara Wilhelm marriage entry, 1 April 1763. Philip Jacob Konig (1738-1792) was the son of Johann Nicolaus and Maria Margaretha (Stuber) Konig, of York, Pennsylvania. Maria Barbara Wilhelm (1740-1779) was the daughter of Johann Jacob and Anna Catherina (Unruh) Wilhelm of Lancaster, Pennsylvania. The marriage occurred in Lancaster in the home of Maria Barbara's father. While this is a Derivative Source record, it is Primary Information and Direct Evidence of their names, their fathers names, and the marriage event. I may be able to find the actual record (probably in German) in the Lancaster church records in the FamilySearch Catalog. Philip Jacob and Maria Barbara (Wilhelm) Konig are my 5th great-grandparents, through their son Philip Jacob Konig (1764-1829) who married Catherine Ruth (1770-1813) in about 1789.